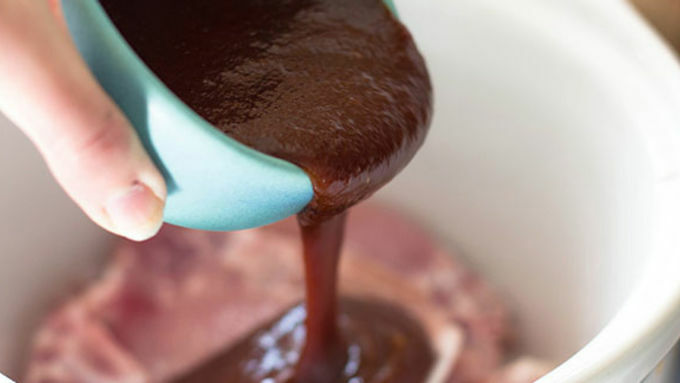 Place pork and barbecue sauce In a 3 to 4 quart slow cooker. Cover with lid and cook for 4 to 6 hours on high. One hour before serving, open the lid and shred the meat with two forks until very finely shredded. Leave the lid off and cook on high for another hour. 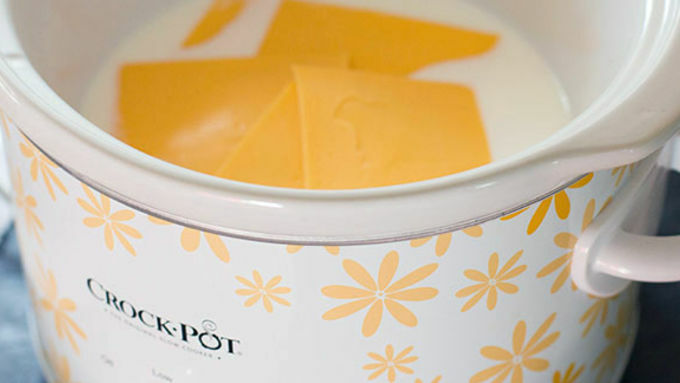 During the last hour of pork cooking, start the cheese sauce in a second 3 to 4 quart slow cooker. Whisk together the milk and corn starch in the crock. Add the cheese slices to the crock. Cover and cook on high for 1 hour, or until the cheese is melted. Whisk together until smooth to make a cheese sauce. Serve the pulled pork and cheese sauce salad-bar style on a buffet table with small bowls of green onions, jalapenos, cilantro, and red bell pepper. 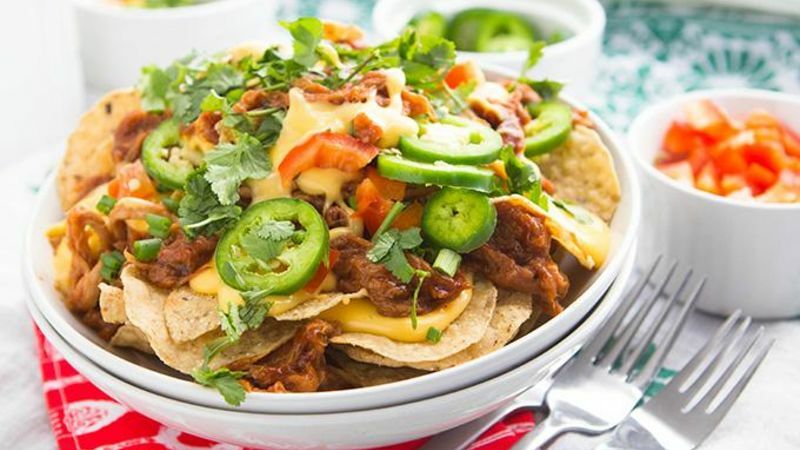 Invite party guests to build their own nachos by piling all ingredients on top of the chips so they can customize their own toppings. There are regular run-of-the-mill nachos. Chips 'n cheese 'n blah 'n blah. And then there are PULLED PORK nachos. Heyyyyyy party animals! Pull out the team jerseys, paint your cheeks and fire up your slow cookers. It’s time for last-minute easy-peasy game day snackin', and we’ve got a dish so quick (and so wildly delicious!) you’ll feel like you’ve been recruited as MVP of Team Party Eats. 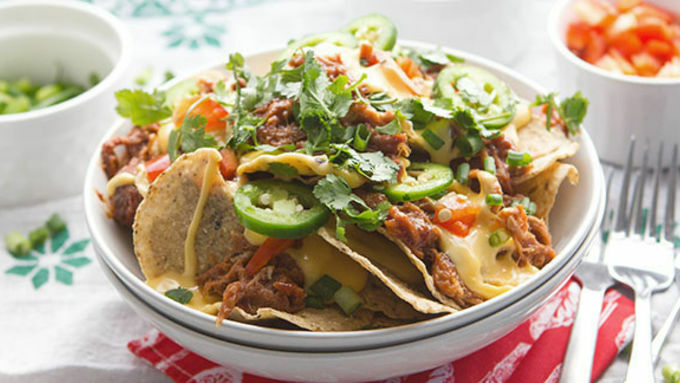 These Pulled Pork Nachos are the ultimate snack to serve to a crowd. They’re familiar classics, but with a big ‘ol tasty twist. The best part? A couple of slow cookers, a few minutes of prep, and you’ll be feeding a big ol' cheering crowd in no time at all. Get a head start by grabbing a bag or two of Food Should Taste Good chips the next time you go to the grocery store. I love the olive or multigrain flavors, but you could also make the jalapeno or sweet potato varieties into the most delicious flavor combinations ever. You’ll also need two slow cookers. 3-4 quart (the small to medium-sized ones) make the ideal bake-n-serve size. When it’s time to party, place your slow cookers on a buffet table with bowls of green onions, cilantro, jalapenos, red peppers, and Food Should Taste Good chips. Invite party guests to pile everything high on a plate and customize their own portions. Serve with napkins and beer. This recipe it something worth cheering about!